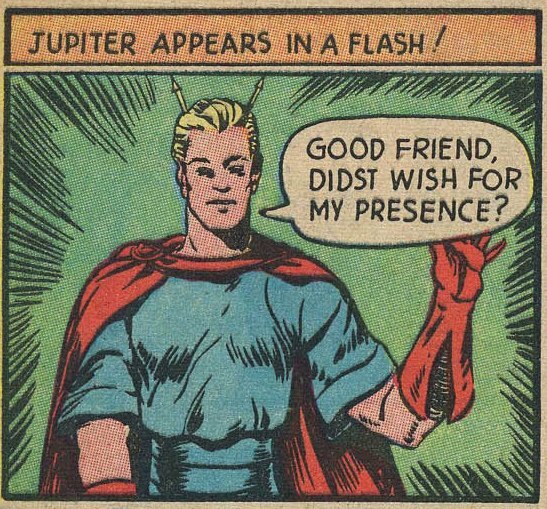 "Well Balthar! 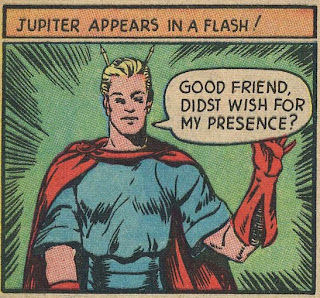 There's some good in anybody -- if you know how to bring it out!!" 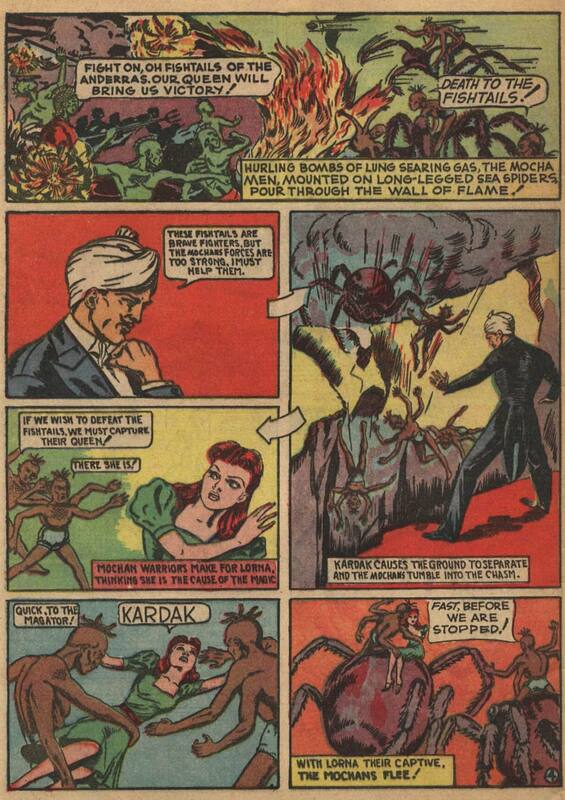 "Kardak, the Mystic Magician, has uncanny, unexplainable powers which are fortunately used for the suppression of evil!" 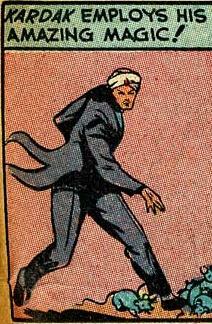 When he made his first appearance, Kardak was simply called "The Mystic". In his third adventure, the story title changed to Kardak the Mystic, which is where we learn his name. Kardak started out with some wild adventures, traveling to an undersea kingdom and then going on a long trek over several issues to reach the Land of the Master Brahmins, who were magical enemies of civilization. Once he defeated them, his adventures became more mundane, as he fought against crime and corruption, as well as against some just mean folks! He helped the unlucky and stood up for the poor and downtrodden. Balthar (Kardak's servant), Lorna Delroy (Kardak's fiancee) and Kardak himself. 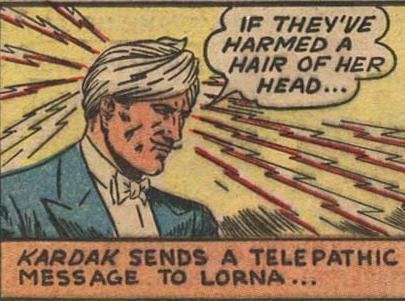 Kardak traveled at first with his fiancee, Lorna Delroy, and later with a servant, Balthar. 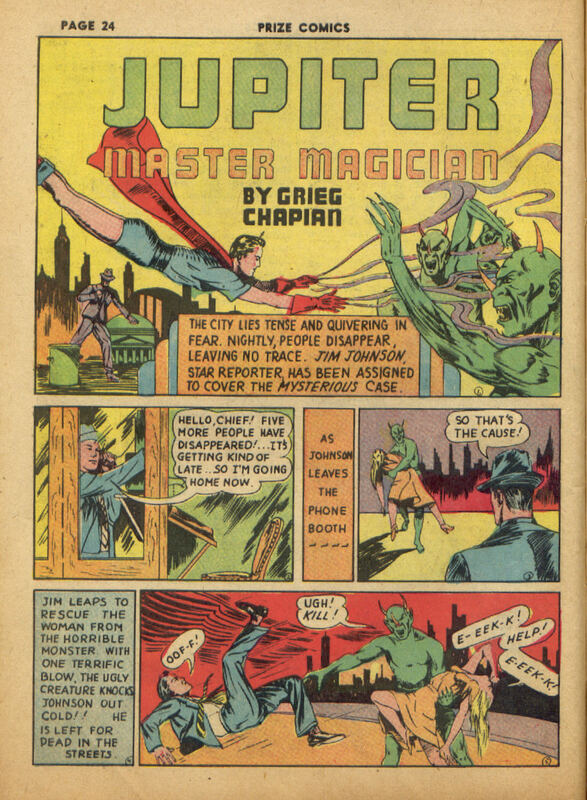 His magic could accomplish almost anything, except it would not work against the dead. 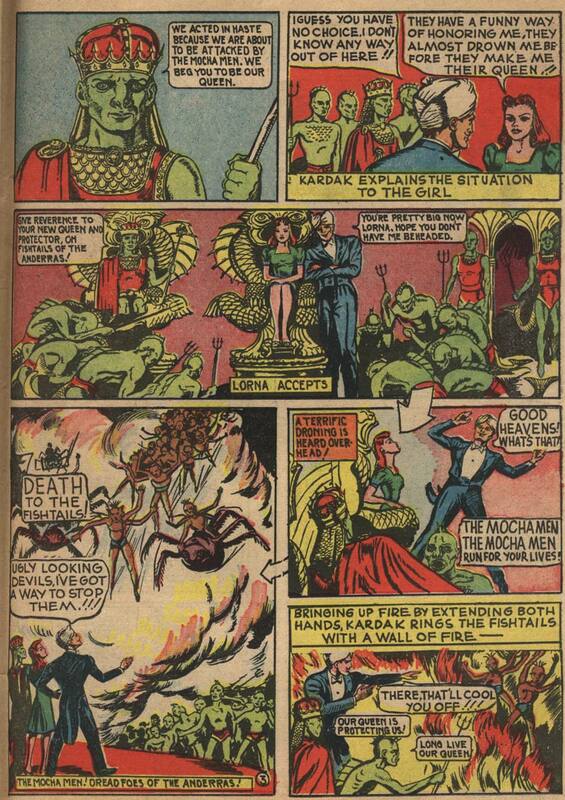 Kardak's magic resided in his eyes and when his eyes were covered, his magic disappeared. 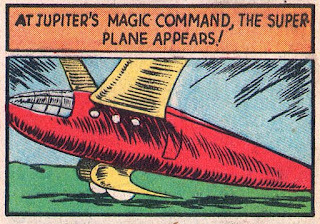 Changed objects from one thing to another. 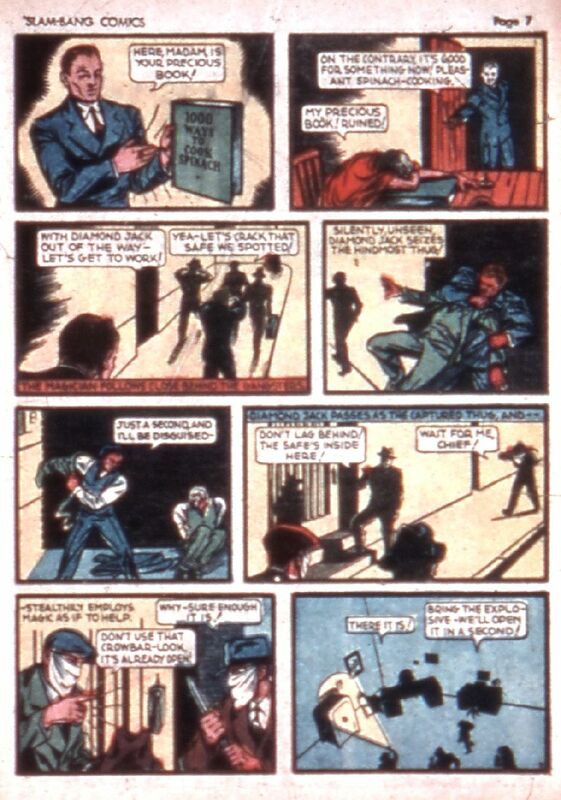 Sent his shadow to do tasks. 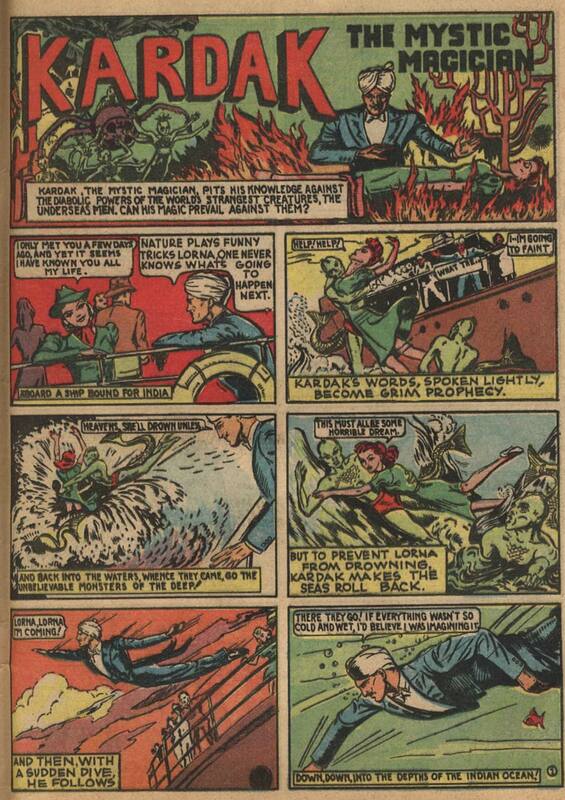 Controlled the weather, such as creating gales. Changed his size to shrink or grow into a giant. 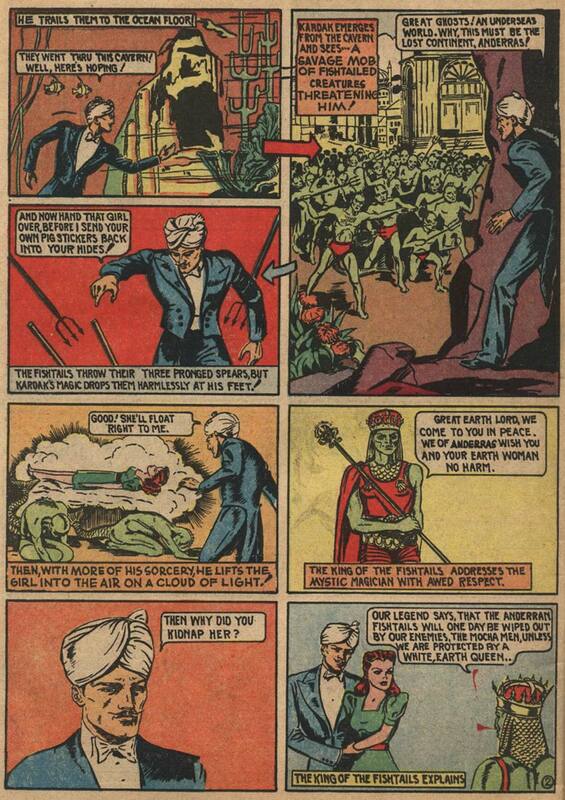 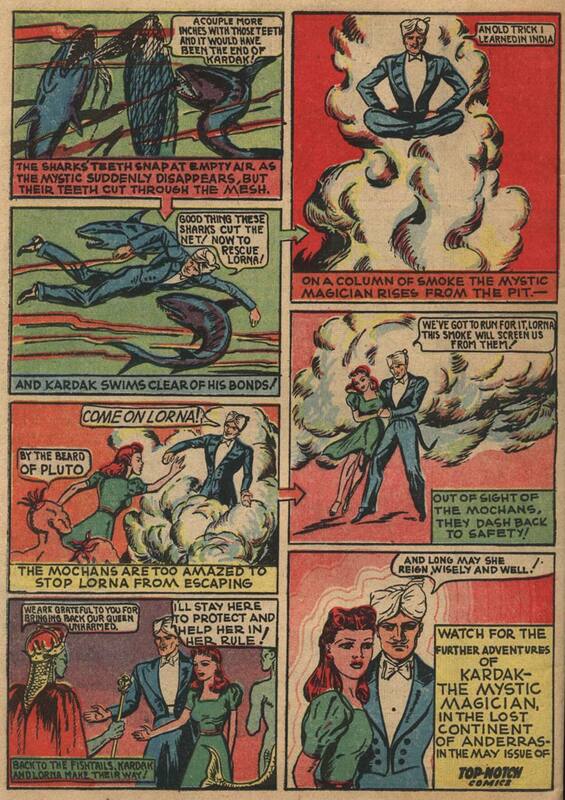 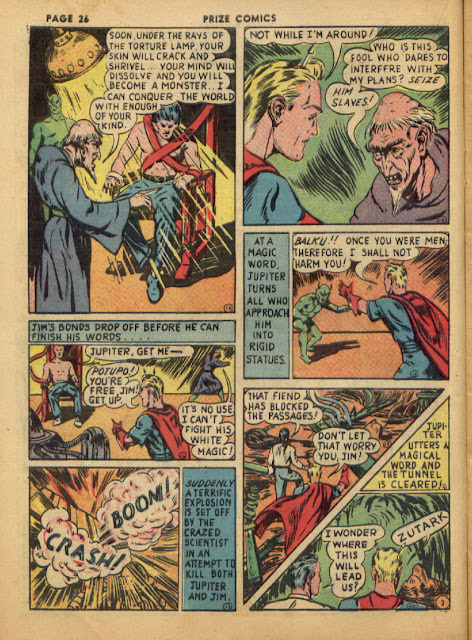 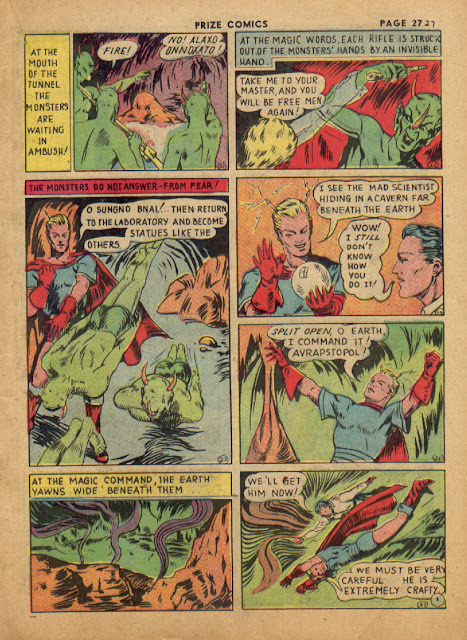 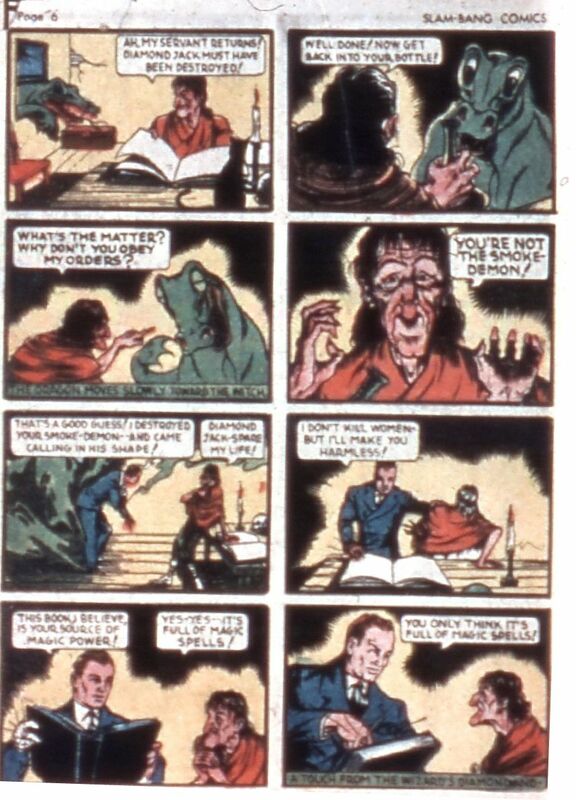 Kardak the Mystic Magician appeared in Top-Notch Comics # 1-2 and then # 4-27. 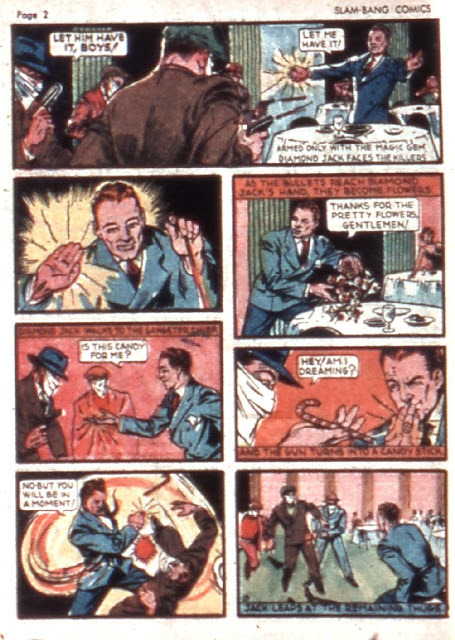 When the comic changed names to Top-Notch Laugh Comics, he appeared in issues # 28 and 29. 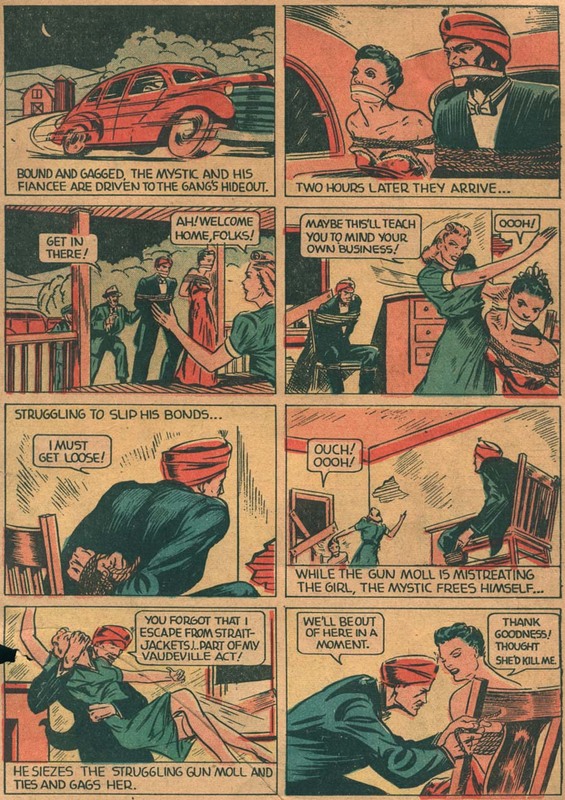 The first comic below is his first appearance in Top-Notch Comics # 1, where he is only referred to as The Mystic. 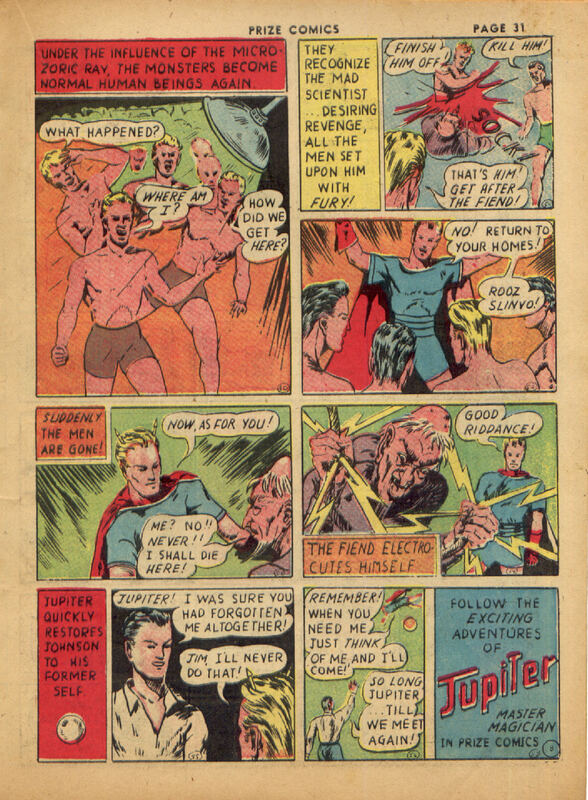 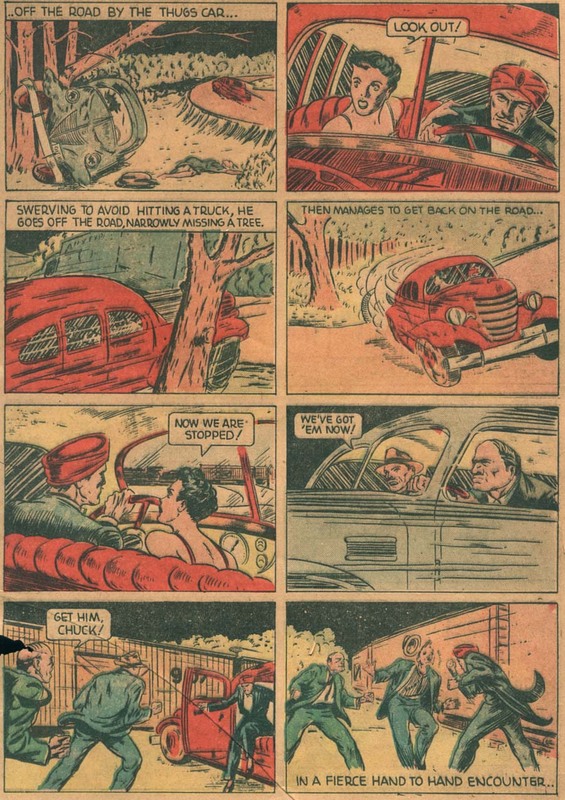 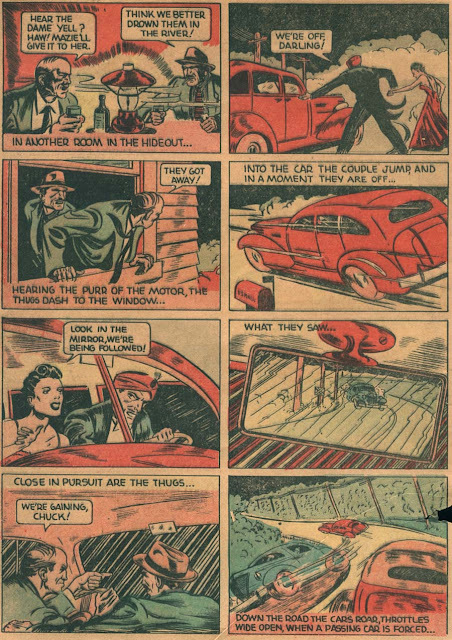 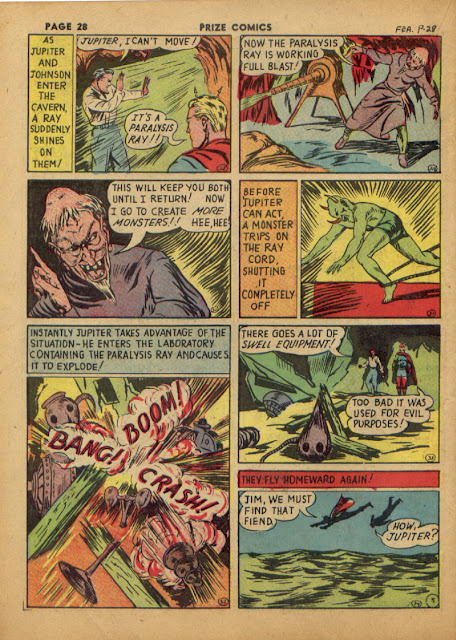 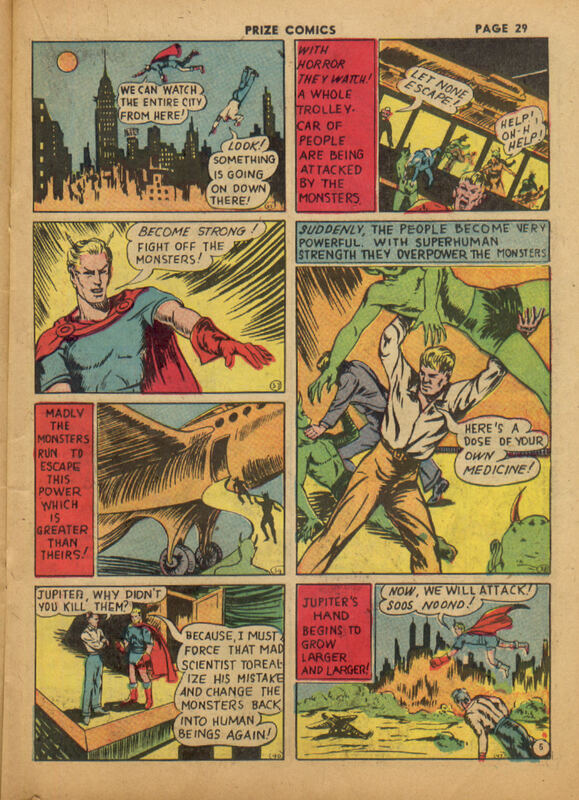 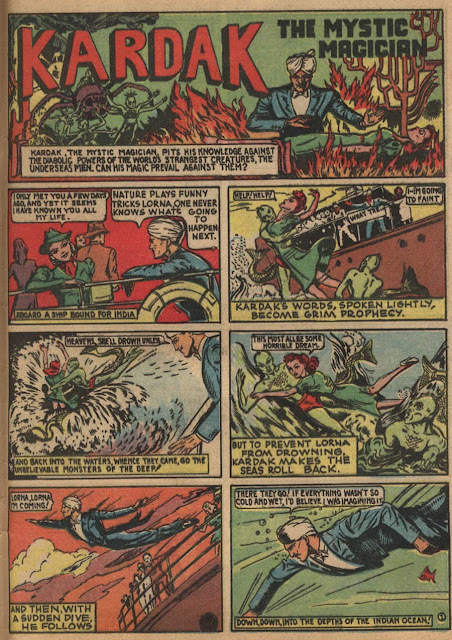 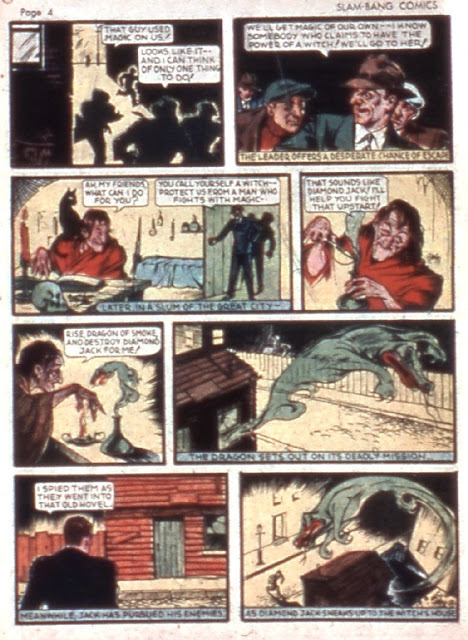 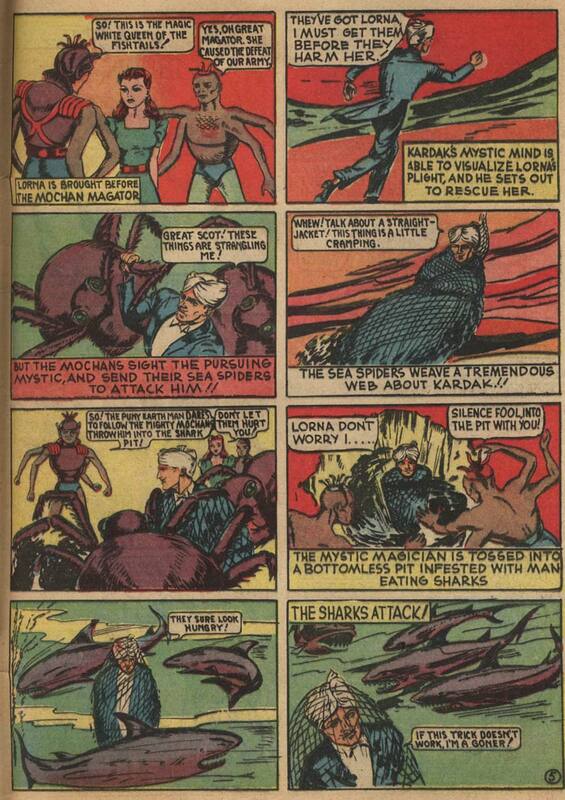 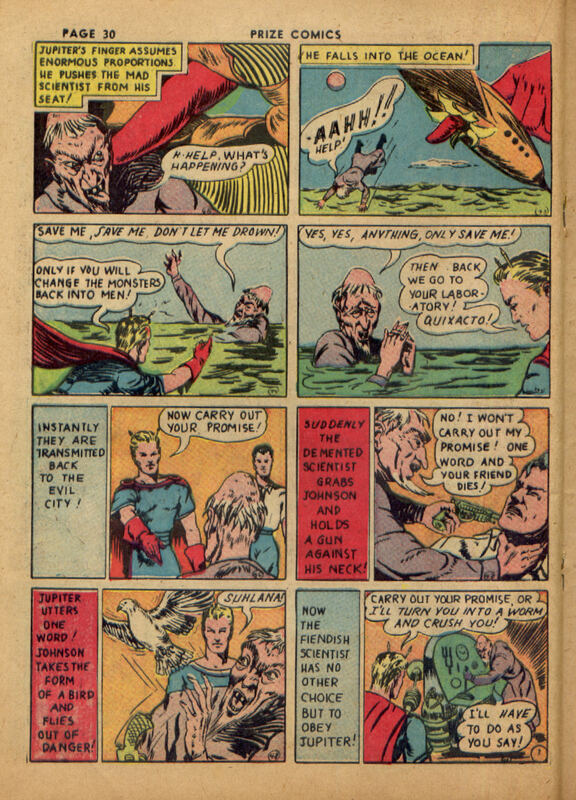 The second comic is Top-Notch Comics # 4, where he is first called by his name, Kardak. 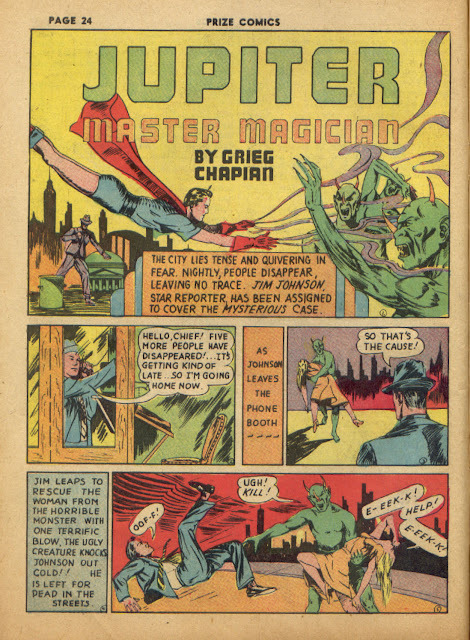 "The only magic I'll use will be these two hands!" Diamond Jack was given a magic diamond encased in a ring by an aged magician who taught him how to use it to "aid the worthy". The diamond was once the eye of an evil god. 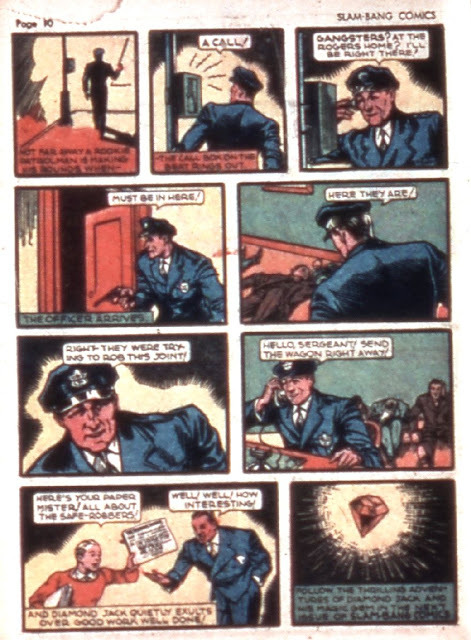 The power of the ring manifested in traditional mystical ways such as changing objects from one to another and allowing Diamond Jack to control objects or people. 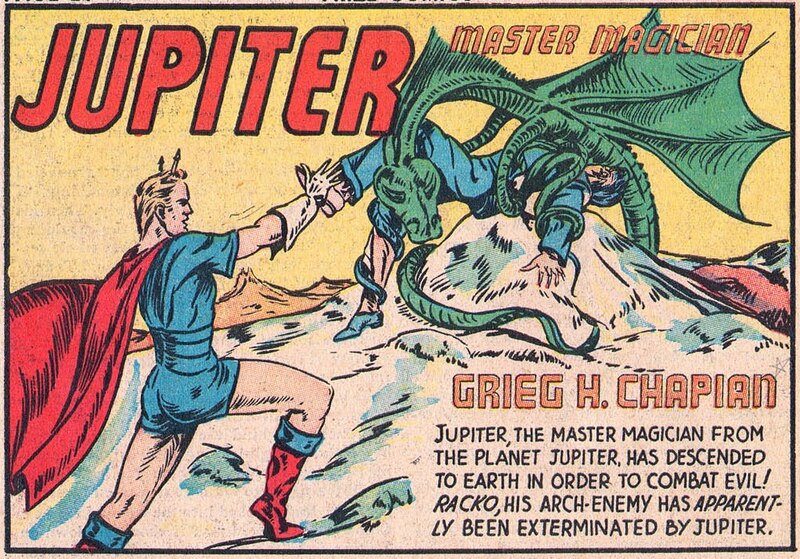 It also granted him superhuman powers such as strength, speed, flight and invulnerability. The magic used was dependent on his concentration. 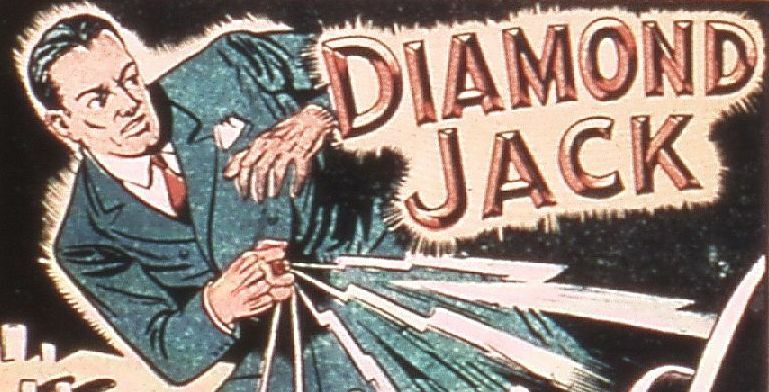 Diamond Jack used this magic ring to fight criminals, vampire, demons, sorcerors and even an evil god. 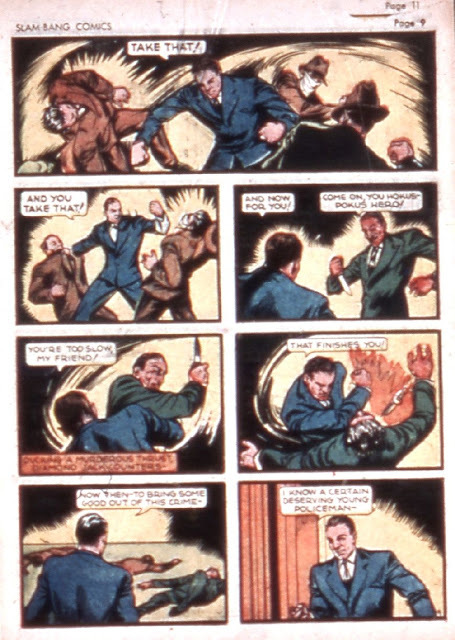 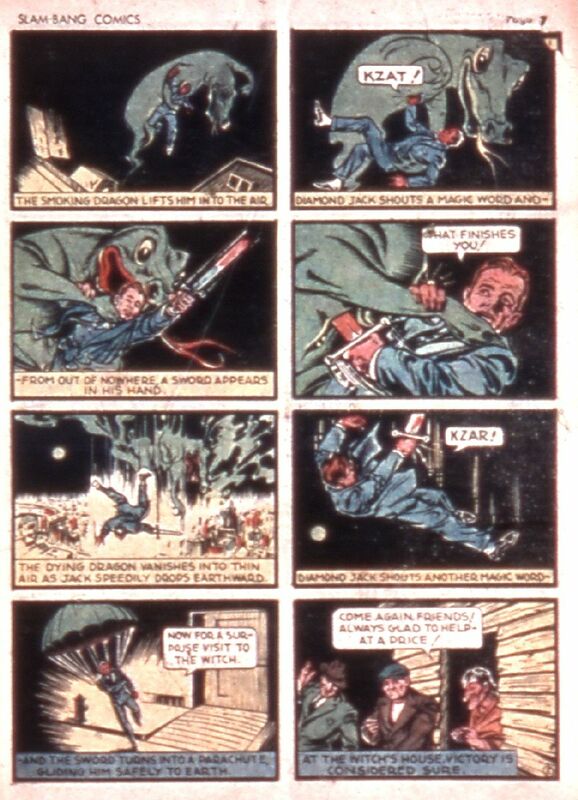 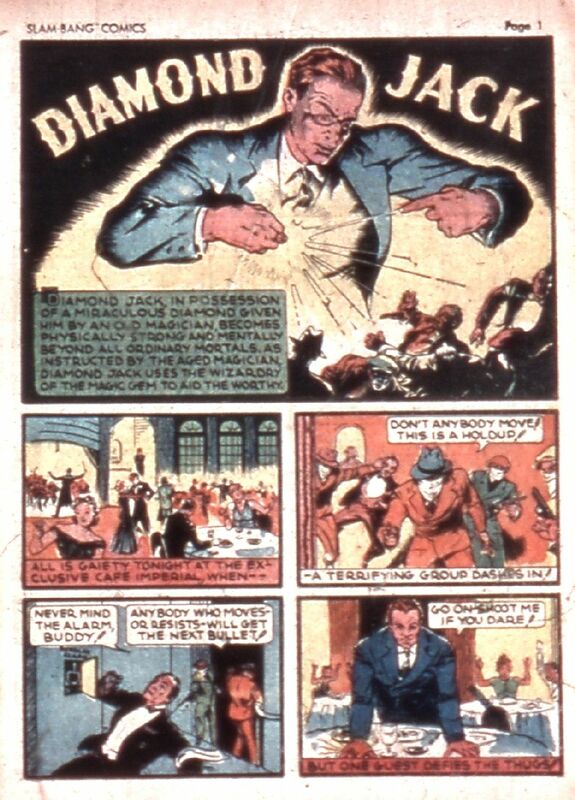 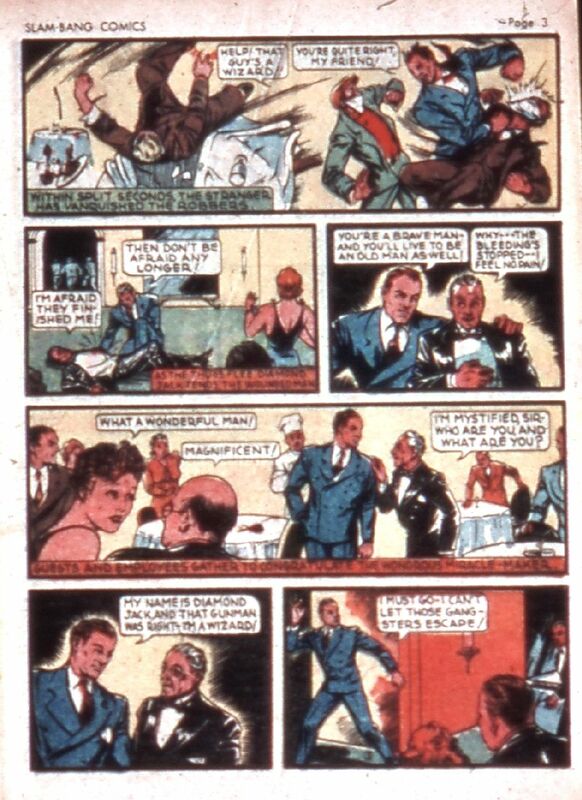 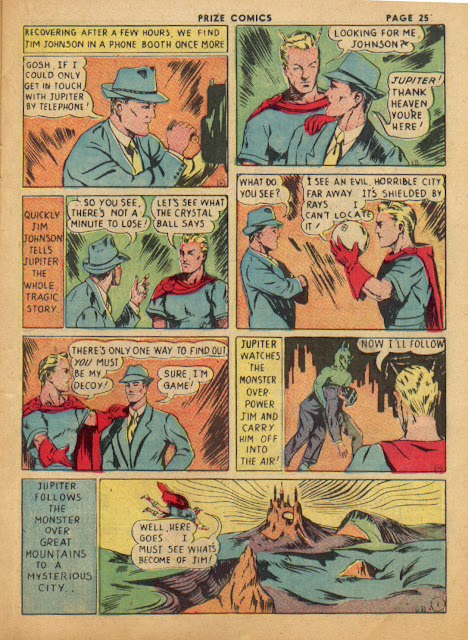 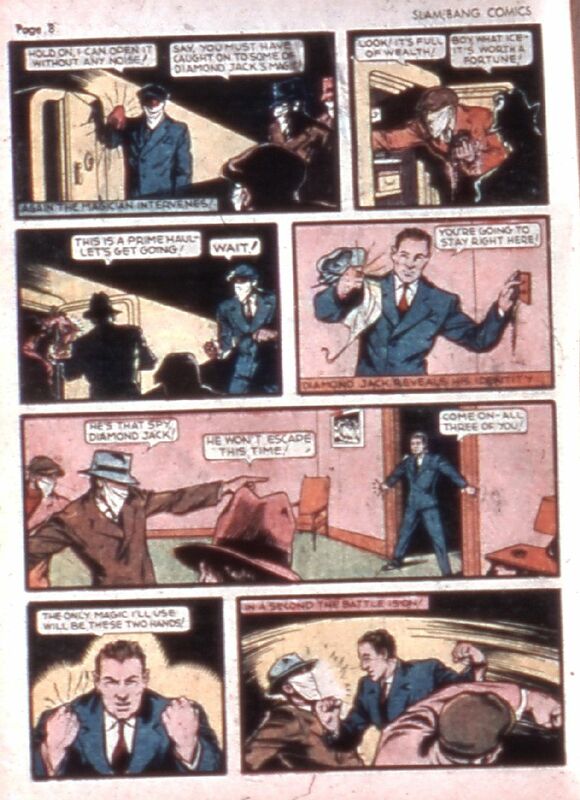 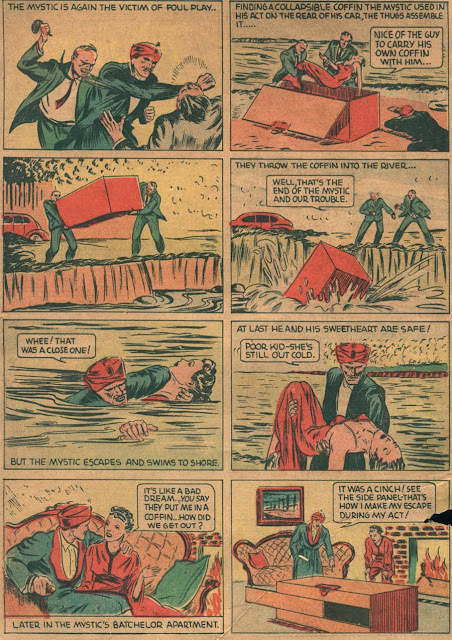 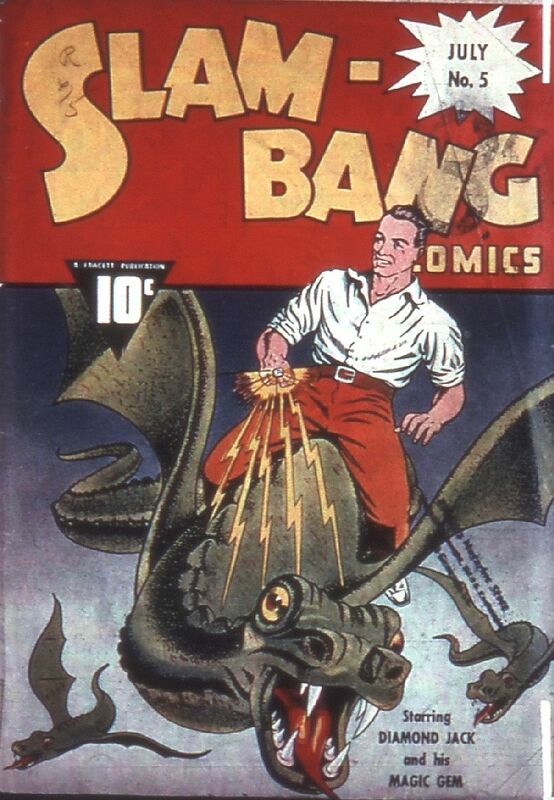 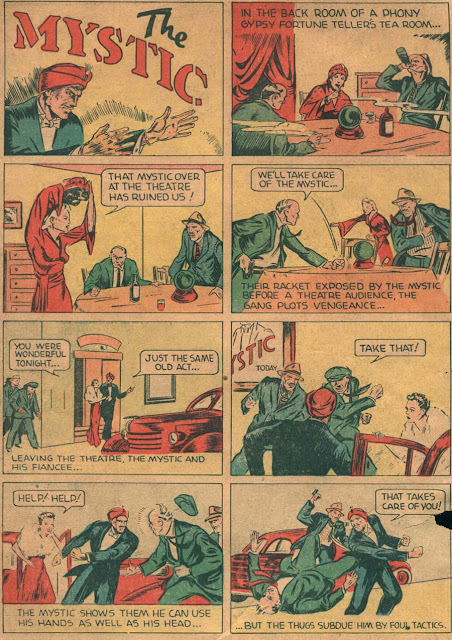 Diamond Jack appeared in Slam Bang Comics # 1-7 and Wow Comics # 1. 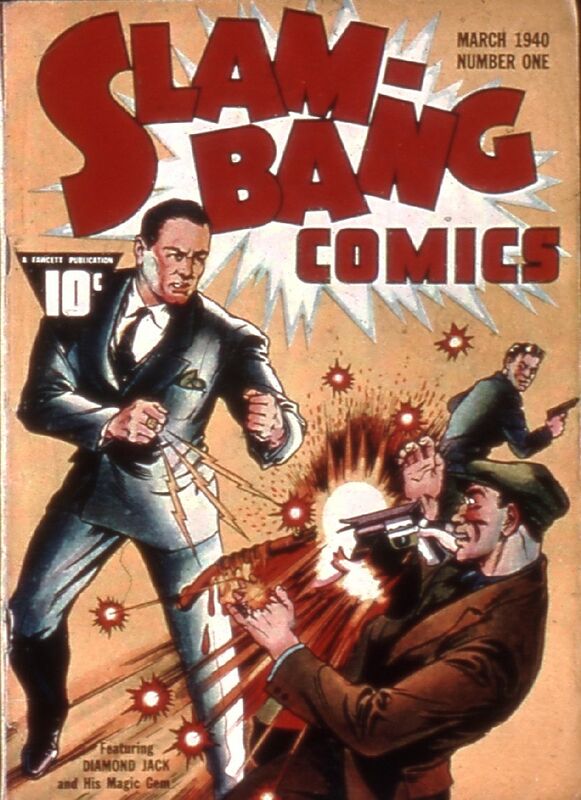 The following is from Slam Bang Comics # 1.